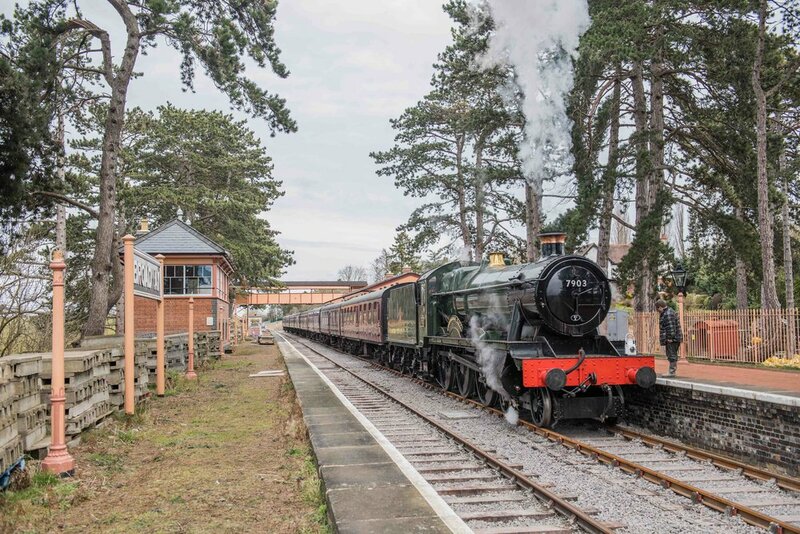 History was made on the Gloucestershire Warwickshire Steam Railway on March 9, with the arrival of the first steam-hauled train into Broadway station for over 50 years. ‘Modified Hall’ No. 7903 Foremarke Hall became the first steam locomotive to call at the GWSR’s new terminus since 1960, almost 58 years to the day since the last steam-hauled train graced the station on March 7 that year. The Great Western 4-6-0 was hauling an eight-coach gauging train to ensure that no adjustments needed to be made to either the station or permanent way ahead of Broadway’s official opening on March 30. GWSR chairman Richard John says: “The railway’s volunteers have gradually been rebuilding the railway from scratch since 1981, when we took occupation of Toddington station. “In 1984, we ran our first train over a few hundred yards of track at Toddington and have gradually extended since then, painstakingly replacing track, building stations, signal boxes and other infrastructure, repairing bridges, embankments and drainage systems as well as restoring carriages and locomotives. “The line reached Cheltenham Racecourse to the south in 2003. Now with the opening of Broadway station to the north, following a highly successful share offer that raised over £1.3m to finish the work, our line is nearly 15 miles long. Lord Richard Faulkner, who will be officially opening the railway at a special event on March 30, added: “I’m hugely looking forward to the privilege of flagging the first train out of Broadway station, 58 since the last one departed. “It underlines what can be achieved by the astonishing determination of well-coordinated and visionary volunteer effort. This is a railway that has come a long way in every sense, since the first moves to preserve it back in 1979. Tickets for the first public train into Broadway since 1960 can be purchased here. For more information about the Gloucestershire Warwickshire Steam Railway and its future plans, buy the latest edition of Steam Railway, on sale now.